Do fat-soled running shoes protect aging joints? view another article... This foot condition is the new back pain — it’s everywhereCarestream, CurveBeam to spread word about weight-bearing CTNew Cartiva ImplantPain Free Plantar FasciitisUFAI featured on ABC NewsCarolina Panthers Star Lotulelei's Foot InjuryFoot Surgery InnovationsBiggest Opportunities for Foot SurgeonsDoctors TV Show - Foot Surgery while Pregnant10 Diseases Your Feet Can Reveal, Readers DigestPlantar Fasciitis TreatmentsThe Doctors TV, Living with Plantar FaciatiisHow to Stop Foot Pain for Good44 Ways to Correct Hallux ValgusAnkle replacement can restore mobilityCam Newton's Ankle InjuryMinimally invasive Foot & Ankle Surgery49ers' Crabtree 'amazing' Achilles recoveryAbout Kobe Bryant's Knee InjuryCurry more likely to play than Bryant3-D Scan Reveals Foot Damage by High HeelsAlbert Pujols' Foot InjuryWill Kobe Return? Doctors Raise Questions About Laker Star's Future In The NBAWhat Kobe must do to prove 'doubters' wrongKobe Bryant's difficult task ahead after injuryPau Gasol's return from foot injuryIs barefoot running a bad fad, or better choice?Born to Run Barefoot?Born to run barefoot? Some end up getting injuredCan a $15 basketball shoe have game? Experts do know that when it comes to footwear, thicker soles, like those found on some men’s dress shoes or clogs, tend to provide more support and comfort, says Dr. Babak Baravarian, chief of podiatry, foot and ankle surgery at UCLA Medical Center, Santa Monica. Fat-shaming is over — when it comes to running shoes, that is. Call them high-cushioned, maximal or fat, the latest trend in running is shoes so thick they almost look like orthopedic footwear. But whether thicker soles actually protect middle-aged joints or injured tendons is unclear, doctors say. Until recently barefoot running was all the rage. People slipped into shoes that resembled aqua socks more than proper footwear to improve their running. It turns out that these shoes caused injuries and recently FiveFinger Shoes settled a lawsuit for overstating the health benefits. The tide has changed with runners going from less to more. The fat soles might help runners with injured Achilles tendons feel less pain and reduce stress on joints, in theory, at least. There aren’t any studies on the thick-soled shoes, yet. “Usually when we have a shoe that is fairly thick-soled and has decent support that is not wobbly … that is better than a thin-soled shoe,” says Baravarian, who believes barefoot running has absolutely no benefits. Fat-soled shoes aren’t exactly new, just a twist on the neutral running shoe, explains Bryan Heiderscheit, director of the University of Wisconsin Runners’ Clinic and the Badger Athletic Performance Research. These shoes have all the basics of a traditional running shoe with added padding and support and a deep foot well that keeps the runner balanced. “We haven’t yet seen any good studies done on this one. When people have brought them in and [we] measured the reaction … ultimately they worked they way they are supposed to work,” Heiderscheit says. The padding in these shoes is distributed to minimize heel to toe drop to about four to six millimeters, less than a traditional shoe, which can have a 10 to 14 millimeter drop. It is yet another way fat-soled shoes claim to reduce impact. “The thicker sole provides a little more comfort during the foot strike because there is more cushion there. With that increase in that cushion, people are saying they can run longer distances,” says Kelley Anderson, a primary care sports medicine physician at UPMC Center for Sports Medicine. While the thick-soled shoes might benefit some runners, others might find them painful and uncomfortable. 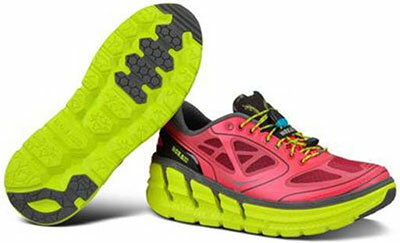 The experts recommend that runners, whether experienced or novices, select shoes based on comfort, not changing trends. “Stay away from the latest gimmick,” Baravarian says. Some runners might really like thick-soled shoes and see their gait improve with them. Others might benefit from a minimalist shoe, while still others will do best with the average running shoe. “[Trendy] shoes can create such a split as to who likes it and who doesn’t like it,” says Heiderscheit. Also, there is only so much a shoe can do to help a runner. “It’s not a quick fix and the concern is that maybe it is not the right shoe for the foot type,” says Anderson. Heiderscheit says that form is more important to a runner’s success than a new shoe. But, some runners hope that something novel will help them. When looking for running shoes, people should select a shoe that fits well. “Go to the shoe store and have them fit you properly,” Baravarian says. And, don’t let the shoes fall apart before buying a new pair. Geier says runners need to replace their shoes often, every 500 miles or six months. “The risk comes if the shoes start to wear,” he says.